Porsche There are 2 products. Our Core Exchange option makes it as easy as buying new cylinders - we send you upgraded cylinders from our stock, and you ship back your old cylinder(s) afterwards for core credit. 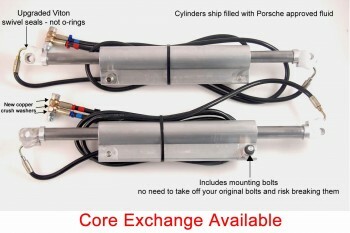 Not all Porsche 911/996/997 model year cylinders are interchangeable - please specify the model year of your vehicle in the comment section when placing a core exchange order, so that we can ship upgraded cylinders that match the originals in your roadster. We replace the OEM rod seals with cup seals made of a far superior material that is not vulnerable to water or additives in the hydraulic fluid, and that should last about three times as long as the originals under the same circumstances. Top Hydraulics also manufactures superior port seals (swivel seals, where the hose fittings attach to the cylinders), and superior hydraulic hoses for your cabriolet hydraulics.